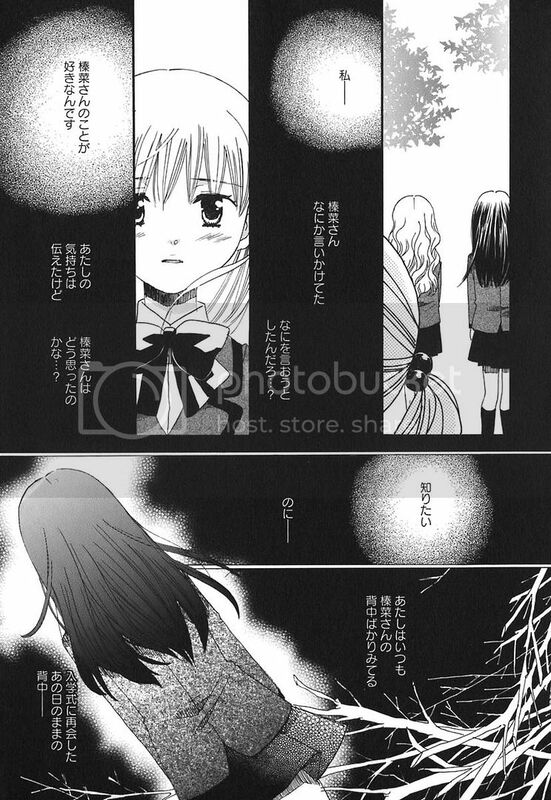 Recapturing from the previous chapter, Chika overcame with emotions, confessed to Haruna that she likes her. 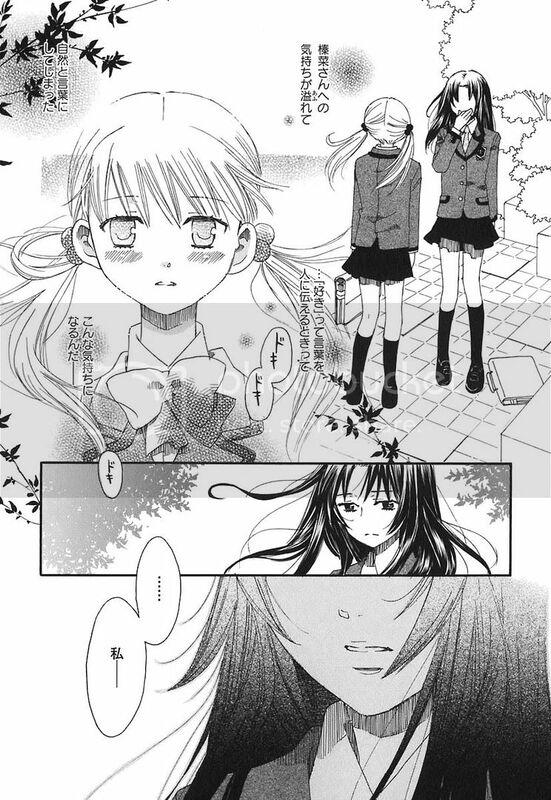 Just as Haruna was about to say something, Haruna's classmate, Shirakawa Miyu came looking for her. With that, Haruna left with Miyu leaving Chika bothered about what Haruna was about to say before Miyu interrupted them. Chika also wanted to know how Haruna left about her confession ... yet all she felt was the coldness of Haruna's retreating back. Meanwhile, Chika was feeling terrible and torn over her believe for the warm Haruna she first met and she desperately aching to know what happened to Haruna. 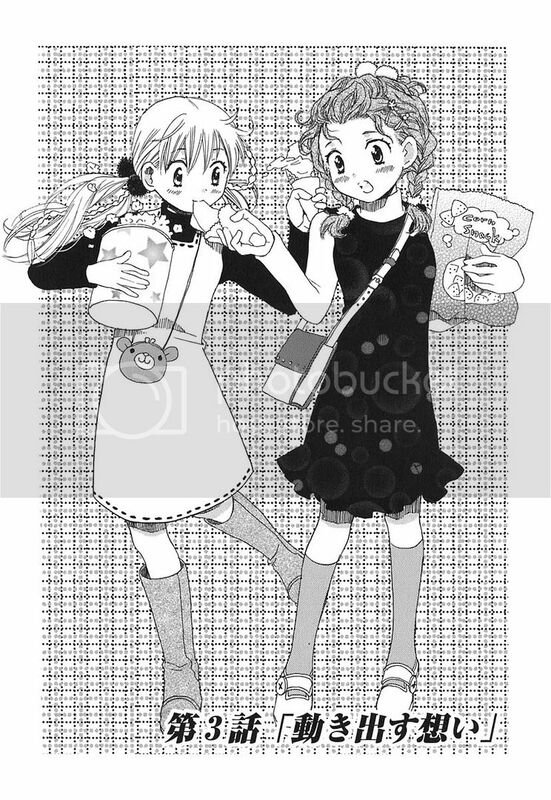 During break, Chika was seriously zoning out, barely touching her lunch, Akiho decided to cheer Chika out by inviting her out on a shopping date. The next day, Chika arrived late for their date but then Akiho merely brushed it off and they went all out on having fun that day. While having a break, Chika thanked Akiho for readily being her first friend in Tsunojo [Short form for Tsunokamizaka Girls' Academy]. Akiho then cheekily replied Chika to tell her what happened caused Chika to feel depressed recently. Chika replied 'I like you ...', causing shock to Akiho as she thought Chika was saying that line to her lol when Chika added that she said that line to Haruna. Akiho was surprised that Chika confessed to her Onee-sama and consoled Chika that Haruna probably felt confused and it's not like Haruna hates Chika or anything. 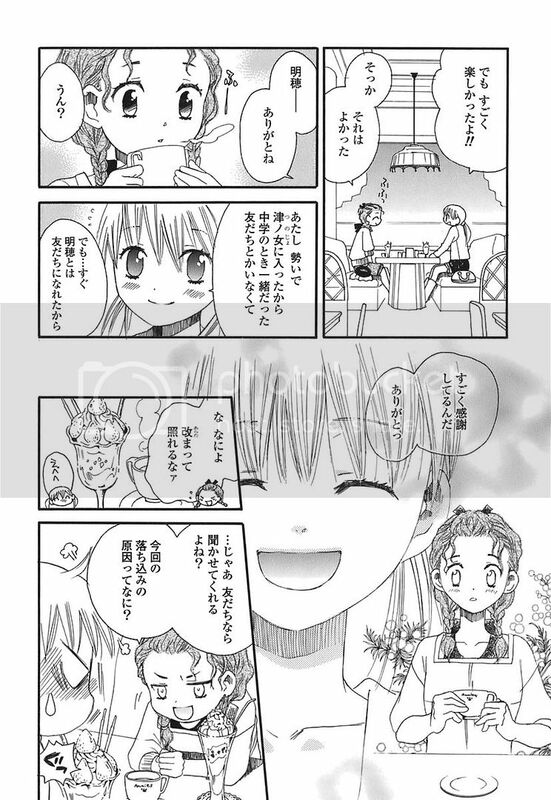 Akiho accidentally splatted some of her offered parfait to on Chika's face then the tense atmosphere was gone. However, Akiho had a serious expression on when Chika left for the washroom, her friend had confessed to her Older Sister ... In school, Chiori hollered at Chika for failing her mock exams and nagged at her for slacking in her studies even though she's borrowing Akiho's notes. Chika meekly stood there as Chiori reprimanded her until Akiho came to her rescue lol. Chika merely accepted the scolding and looked dejected. Meanwhile, at Haruna's home, Haruna was staring at the handkerchief Chika returned to her. Just then, there was a knock on the door, Akiho called Haruna 'Onee-chan' [More informal than Onee-sama] and asked if she could help her with her maths homework. Haruna giggled at when Akiho called her Onee-chan again and asked Akiho why she changed to 'chan' at home. Akiho blurted that Haruna behaved differently at home and at school too ... Haruna realized that and agreed. Akiho then told Haruna that Chika did badly for her mock exams that she had to retake them. Chika then suggested that Haruna teach Chika maths because Akiho's not really good in maths. 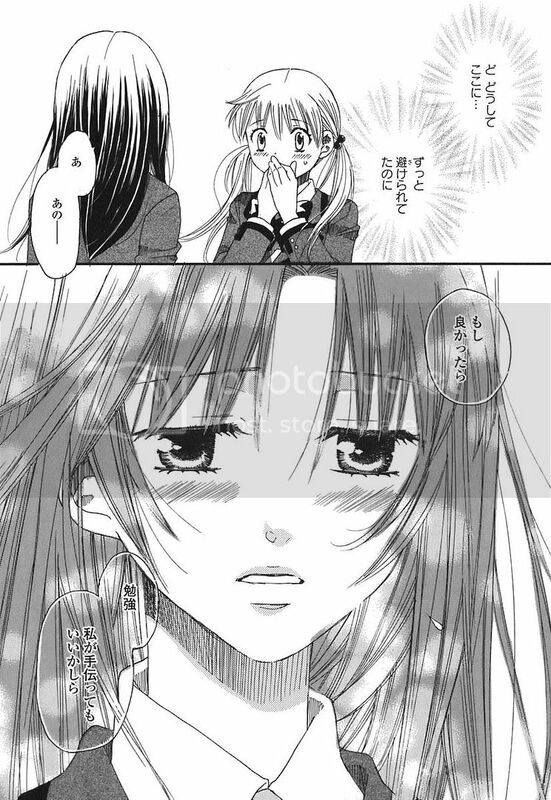 Haruna wanted to refuse ... but with Akiho's begging and her flashbacks of the moments of her and Chika when they met for the first time lead Haruna to hesitate. The next day after school, Akiho brought Chika to the library to study for her make-up exams. When Chika complained that she doesn't feel like studying, Akiho shot back that she doesn't have a choice and left Chika alone in the library to study as she had a committee meeting lol. Chika reluctantly went to the spot Akiho picked for her and nearly felt asleep when she noticed a shadow in front of her. Hmm, this chapter was interesting, we can see Chiori interested in Akiho, Akiho interested in well, I'm not sure if it's Chika or Haruna lol. Thanks to all my friends who celebrated my 21st Birthday gathering last night, I really had a great time, hope you guys had a great time and ate your fill XD. I take pride in feeding people lol. Ah, thanks for the prezzies too! After all that, it's so amusing to think back, 'Yay party's over but um, I'm still not yet 21 lol. ', hahaha. wow thnx for chpt 3 cant wait for the next one. congrtz on turning 21!! i think....lol is honey crush out yet? i really hope for the next ch! thnx again!! to anonymous, welcome and thanks. Hopefully I can post chapter 4 this weekend. Honey Crush Chapter 2 is out but it's in Japanese, so I'm waiting for the Mandarin version to come out. Check out yamibo if you can't wait =). heyy!! im the first anonymous. umm isnt yamibo in a diff language then english!? cause i cant read i single word!! lol all well thx though ill just check each week to see. like how im reading the 4th chpt right now!! yeah! !